This is not a grumble about the ever-growing complications of home electronics devices, where the key to success appears to be in ignoring 90% of the buttons. Nor is it about the annoyances of continual software upgrades that leave a trail of incompatibilities in their wake. Or about high-tech running shoes that have replaced the then-ubiquitous simple plimsolls that were part of our school uniform. This is about a saucepan. 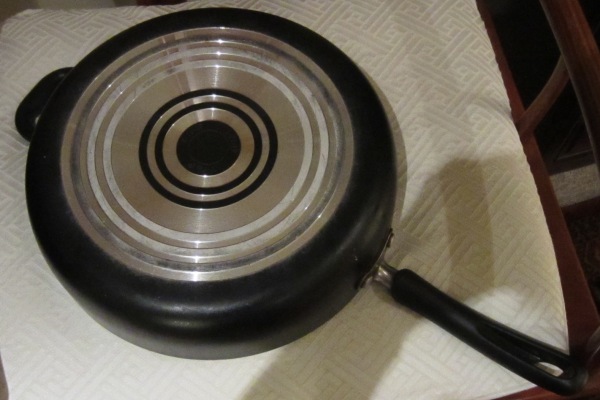 This saucepan, in particular, a simple 11″ T-fal with a glass lid. It seemed to fit right in with our cooking styles, and in the 2 or 3 years we’d owned it, we had used it again and again and again. You can’t see it in this photograph, but the Teflon coating had started to wear out and look gray and patchy. It was time for a new saucepan. We went back to the same store, and were delighted to find the same T-fal saucepan in the same size at more or less the same price, too. So we brought it, broke it out of the packing, tempered it and started cooking. Something was wrong. While the old saucepan had sat stolidly on the stove while I stirred its contents, this one moved on the stove like skates on ice. I had to hold the handle when I wanted to stir it. I couldn’t figure out what it was. 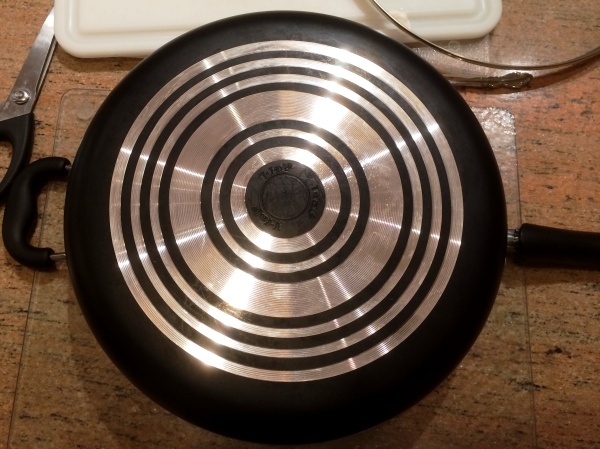 The new pan was identical to the old one. I’m not much of a cook, and I figured maybe there was something I was doing wrong. But the next day, my husband used it and found the same thing. It wasn’t me, he pointed out. He waved the pan at me, upside down. This is what the bottom of the New Pan looked like. Rather elegant and dramatic in its design, I thought. It wouldn’t look like that after a month or two, but right now it was a handsome thing. Oh. But the previous pan was identical, right? Not quite It had the concentric rings, but no Teflon on the outer ones. The Teflon on the inner circles didn’t matter. The way our stove was designed, it was the outer part of the pan that rested on the burner. So that explained it. What we couldn’t understand was, Why? His theory is that someone dropped one operation in its manufacture – scraping off the Teflon from the outer rings. Mine is that someone looked at the new design, as I did, and said That looks so good! And didn’t test it, because after all it’s a minor difference. 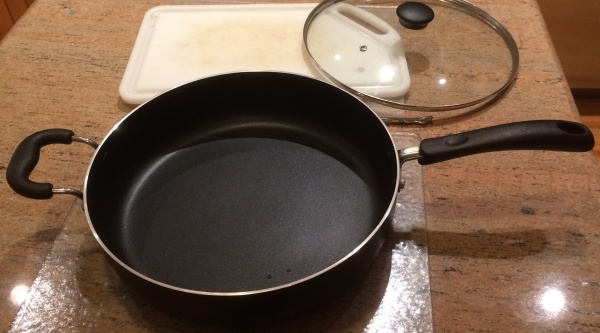 So now for a decision: Return the pan? Or scrape off the Teflon, either deliberately or as time wears on and we keep cooking. I think I’ll keep the pan, hold the handle when I stir, and be pleased that at least it’s not a computer upgraded to futility! This entry was posted in Intriguing Products and tagged new products. Bookmark the permalink. While I’m sure that was a rhetorical question, Rupa, I suggest you either scrape off the Teflon or return the pan, for safety reasons. Unless you are far better cooks than I, either you or your husband will one day inadvertently bump that pan sending its contents flying. 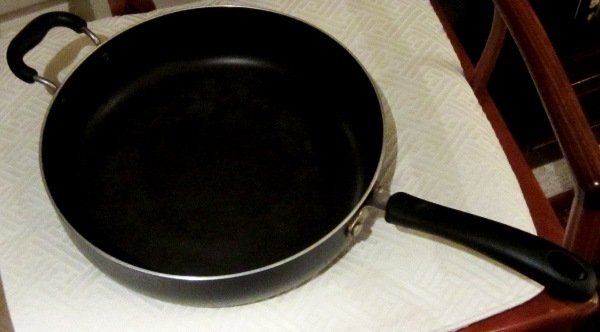 Returning the pan and bringing the issue to T-Fal’s attention might help save a child or someone else from a serious burn. I think we’re going with the ‘scraping it off’ option. I also think that with time and my usual rough handling, the coating will wear off. Thinking more about it, I suspect that it might not be Teflon, but enamel of some sort. Hope so, at any rate – I don’t think Teflon should be exposed to open flame. I think I will write to T-fal and link this blog-post. Yes – but it’s easier said than done. We’re moving in that direction. We do about 3/4 of our cooking in non-Teflon.